One thing I have found that is really different is the shops. I think I got used to getting around between Pattaya and our village of Huai Yai and then Horse Shoe Point by car. I knew exactly where to get what. 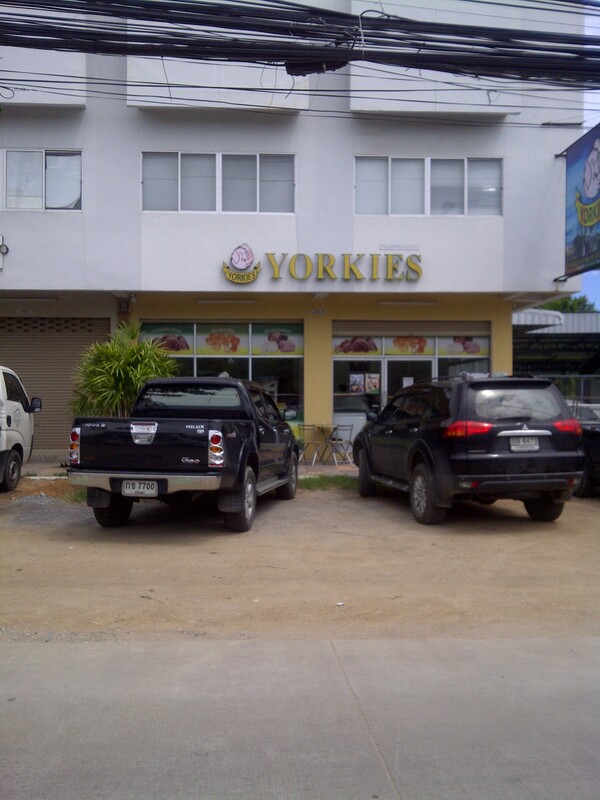 Like Yorkies is the place for lovely bacon, pork pies, and good pork and beef sausages. They also stock a selection of British products. Sometimes more than others, depending on when stocks arrive. I knew I could park. Same goes for the other butchers across the main road onto Chiaybruk 2. Great for Scottish black pudding and sliced ham. Foodland, what isles and what products were best. Now I have to start allover again. I have a page on shopping for new arrivals but that was with Pattaya in mind. Now Bangkok is a different story. I am still finding my way around, thanks to the help of others. They must be thinking oh, no here she is again with her multitude of questions. We went back to Pattaya within our first few weeks of being up here in the suburbs of Bangkok to just stock up on what I call ‘proper bacon ‘and good pork sausages. Sure there must be shops here in Bangkok. Plenty of streaky bacon to be found, even in 7/11’s but what I call ‘proper bacon’ harder to find. You can see packs of bacon and it looks good but when you open it, its as thin as anything. Still haven’t seen any proper black pudding either. I will have to remember to ask the ladies at Mah-jong on Monday. Foodland do good hash browns so we just have to improvise lots of the time. The same goes for coffee beans. There are plenty of supermarkets selling ground coffee. Plenty of exclusive shops selling coffee too, but not good and cheap coffee beans. The average price seems to be around 500 bhat which is way too much for a bag of coffee when you drink as much as I. So I have to hunt for Bon Cafe coffee which is good and much more reasonably priced. In Bangkok and the suburbs there are so many shopping malls. Small ones, medium sized ones, to ones that you can get lost in. We tried Mega at Bang Na, 800 shops, restaurants etc., wow. amazing. I think I still prefer Central Department stores. I think they cater for expats. The clothes sizes are getting better. No all small sizes now at sections called Sophie I found good sizes (American sized) Simplicity and Essentials. Not bad prices either, especially if like last week there was discounts. Ended up getting 20% off 2 pairs of capri pants and 40% off some blouses. When I went to Mega I found that if you weren’t a size zero to a 6 forget it… it just makes you so miserable going to shops like that. Staff and customer service, vary. I find that either they follow you around like you are a shop lifter or you can’t get anyone to serve you because they are too busy with their makeup!!! That’s the norm and you have to get used to it. I discovered Emporium the other day, only for a few minutes as I was getting a lift from Christine. Oh wow the shops. The same when I went into the Siam Centre and Paragon. Its changed since we first went there 2 years ago. Not all designer shops now. Not all over priced and they have so many nice restaurants to eat in too. Still finding it hard to find Tetley Tea bags but I am going home for a visit at the end of the month so I will stock up then. Still no Aquafresh toothpaste either. Weird that somethings are so unobtainable. Thank goodness that ‘Boots the Chemist’ are popping up everywhere too. Shower gel, smellies, face wipes and most of the things you get back home can be found in your local boots, including ladies things that seem non existent elsewhere except big horrible pads. Insist on a boots card too. Some of the staff for some reason don’t want to give you a boots store card to collect points but I found one lady in Boots at Big C mall in Pattaya very helpful. So customer focused. If you find it hard adjusting when you first come to Thailand go to Central at Chid-lom and walk into the food hall. It reminds me so much of Fenwicks back home in Newcastle. Its lovely. So much choice (at a price) and everything so beautifully presented. I don’t think you would miss home so much if you got the chance to shop in here every week. The food bill might be a bit steep though but then again UK prices are no longer cheap either. Bread. I love bread as much as I love cake!!!! Now I know exactly why I put on weight. Sliced bread for me has to be from a coffee shop/restaurant called ‘Au Bon Pan’. 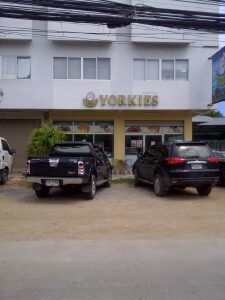 They seem to have many outlets around Bangkok and the suburbs. The bread is light. A good sized slice and they advertise ‘no trans fats’ so it has to be good. Brown only but they do have 2 varieties. While you are there you may as well get an almond croissant. A soft almond filling. mmm…I could just eat one now. OH’s favorite there is the frozen vanilla shake. They don’t advertise it,but its there on a menu at the counter. A real brain freeze of vanilla ice cream. Delicious. If you can manage a whole one. Crusty bread can be found everywhere. So the choice is yours. Cake seems to be a big thing in Thailand and it comes in so many shapes, designs and tastes. When I first came to Thailand, cake looked nice but tasted of nothing or a mouth full of butter. I am pleased to say over the 3 and a half years we have been here they are getting it right. So many good bakeries and outlets. I really don’t know how they make the cake slices for the prices they charge. I certainly couldn’t make a cake for so little. Tesco’s on Pattanakan Road have an outlet in their mall called the Cheesecake House. 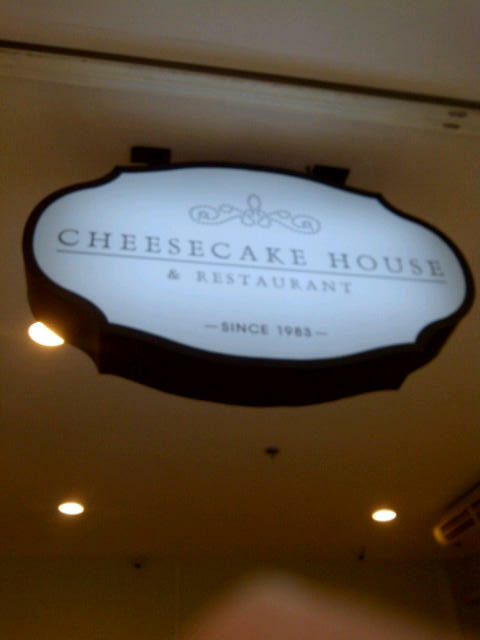 Oh my goodness you should taste their cheesecake and cakes. Wow. Something else. They have an apple crumble cheesecake or try the brownie cakes with peanuts in a what tastes like a sticky toffee pudding sauce on the top. Could easily eat 2 or 3………….mmmmm….my mouth is watering. It is going to be hard to be so good until I go to the UK. I will miss my coffee and cake visits. Even yesterday I went to get my car cleaned and waxed. While I waited I had a lovely coffee. The way it was presented was really nice. 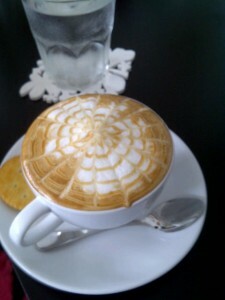 The girls told me they had learned off the internet how to do the designs on top of the coffee from You Tube. Amazing. So I guess I will have to see if I can have a go too. They said you just put in ‘coffee art’……………clever arn’t they. What you will see a lot of is sandwiches and ready made meals on top of counters or on street stalls. Not in fridges. OH paid the price for taking a sandwich from a small coffee shop in the building where he works. It wasn’t in a fridge. So its out in the heat. Oh boy was he sicky sick. You see it everywhere. Sometimes the food has been standing a long time. So be very careful as some of the food looks very yummy indeed. The good thing also about moving up here is there are UK magazines. Again at a price. I used to get my ‘Woman and Home’ delivered direct from the UK. Its a good price and certainly even with postage cheaper than buying them here. The average price for a magazine from the UK to buy over here is around 8 to 10 pounds. If I think of anything else I will add to this post. This entry was posted on Friday, October 4th, 2013 at 4:45 am	and is filed under Shopping. You can follow any responses to this entry through the RSS 2.0 feed. You can leave a response, or trackback from your own site.